Legal stories. Legal business. Legal world. Legal everything. What happened last Friday was a blessing in disguise. Tony Fernandes had the room in stitches when his Acrobat Adobe slides (don't aske me why he did not use Power Point) went bust as the laptop operating system locked-up after being idle for sometimes and no one knows the password. While we waited for someone to tackle that problem, Tony Fernandes took the stage at a talk which was held by the group which had brought a forgotten former finance minister who had took us out of the 1997 economic crisis and the banker brother of our current Prime Minister. Tony was the third in line to speak but was one of the most anticipated. Rarely can someone grill the man who had been the envy of our government's airline and whatever companies he had to muscle in to get some business. Being small but successful had always been something that people always love to hate. And yes, as much as AirAsia is world famous now, it is still a small and growing airline. It still need all the exposure that it can find and it is still young. So, what happened was, while waiting for someone who could fix the problem, we were regaled with his story on how he came to be where he is today. Those stories include how he was left in England by his parents with 50 pounds in his pockets, how he thinks schools and colleges are for sports, how he took up accountancy in London School of Economics, how he became a music executive when he was given a break by his now friend, Sir Richard Branson, how he opted out when Branson wanted to start an airline which he predict Branson could only do by selling his Virgin Records, which he did after six months of Tony moved to Warner, how he met Led Zep before he was asked to head the Warners office in Malaysia, how he developed a few well-known talents (until now) in Malaysia, on how he went to see the former Prime Minister of Malaysia, Tun Mahathir after Tun had a bad day, how he was refused the license and asked to buy an airline, how he approached an airlines on the verge of collapse and bought t for RM1 (around a few cents in USD) and how he brought that airlines to its current status. All these were told without slides and when he started to use the slides, it was another round of stories altogether. Some were well-known, some were just pure revealing. AirAsia is a public listed company and its corporate achievements can be found in its website but hearing it from the horse's mouth was more exciting. He did told us some facts about how he encourages all his staff to upgrade themselves and AirAsia now has a few female pilots and one guy was even a bag carrier before. He told us why he sponsored so many things especially sport clubs including Manchester United which he hates as he is a fan of West Ham FC. He is currently trying to sponsor the red card which the referree uses after he managed to sponsor the referree shirt of the English Premier League. Why he sponsored Oakland Raiders in which AirAsia plane will be launched by Gabenor Schwarzenegger this August (or is it July). He actually wears his heart on his sleeves about what he loves and hates. About companies which he considered as his competitor among them Singapore Airlines, Khazanah and of course, Malaysia Airline System (MAS). All these companies did play a part in stunting his company growth and even his last slide, pictured below is a challenge to himself. At the Q & A session, we were given a very short time to ask and a lady asked Tony to explain how AirAsia can sustain its current gearing was suspected of being a spy of Khazanah really became the center of attention. He answered it gamely and when the talk was over, Tony Fernandes was swarm like the rockstar that all Malaysian thinks that he is (except CEOs of those few companies) and took pictures. 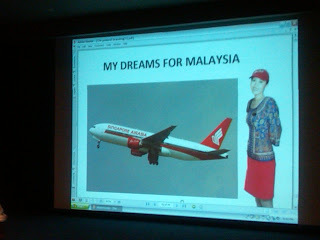 Whatever people think of him or wherever AirAsia is heading, Tony and AirAsia is already a Malaysian success story. How exciting! 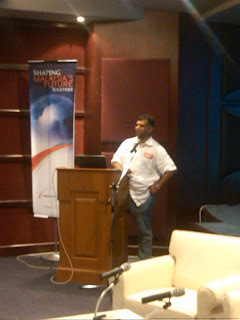 You've met Datuk Tony Fernandes in person. He looks like a down-to-earth guy! Kujie - Nak fly ke Serendah ke? If big companies bribe, how about us? Ferrari California : The Cheapest Ferrari? Air Travel Price War, who benefits? 417: [siri ulasan buku] #46 - laknat karya fahmi mustaffa.